First we’ll hear from Matt Craine – Owner and President, MattCraine.com, who met & proposed to his wife at past pubcons…awwwww. To make contests relevant and successful you need to have a prize of significance, prizes of relevance, don’t give away someone else’s product, Push the promotion. Have realistic marketing objectives. Are you LeadGen, Email addresses, Energize current base, get Likes on Facebook. Know your budget, what type of promo is right for you? Where are you on the pyramid? Let customers help you run your business “Name this product, name this style” Use existing customers evangelize the brand to increase your reach with contests. B2B can take advantage of contests also. Had a paper/toner customer who did a video contest destroying an old printer and gave away a brand new printer. got 1 in 3 customers to submit a video. Get creative, keep prizes big & relevant, promote promote promote, use existing customers to evangelize. Next we’ll hear from Elmer Boutin, Senior Manager Search Strategy, Rockfish Interactive. Was a corporate webmaster before his time at Rockfish. He’s going to share some things about contests from the customer side of things. Successful contests he mentioned were Zagg and a shout out for my friend, Andy Beal and Trackur. Decide what success looks like before you start, and figure out how you’re going to measure it. Give away something people want. Bigger isnt always better. For the price of ONE astronomically expensive thing, buy 10 moderately priced things. Make 1 person happy vs. make 10 people happy. Consider a coupon, coupon-ers share what they find like CRAZY! A contest isnt going to help a bad website or product. You cant make a silk purse out of a sow’s ear….that’s a country-ism from my upbringing, for you city folks. Make sure your servers can handle the traffic. Host the contest offsite somewhere like rackspace so your website doesnt break. Encourage sharing, but dont REQUIRE people to spam their networks. 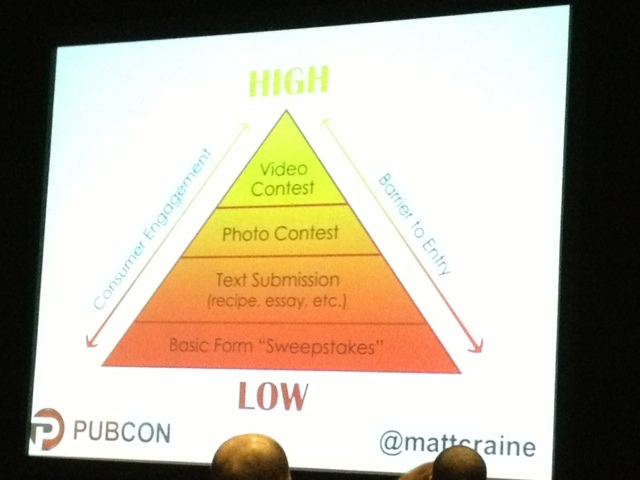 This entry was posted in Industry Happenings, Social Media and tagged PubCon by Carrie Hill. Bookmark the permalink.